As a homeowner, you are in charge of everything. You get to pick the color of the walls, the type of furniture you want to sit on and how you want to decorate every room. You are also in charge of repair and upkeep. Whether you do this work yourself or bring in help these tasks have to be done the right way. Just because you haven’t done any handyman work doesn’t mean you won’t be able to. These are some simple tasks every homeowner should know how to do. When it comes to hanging pictures probably “anchor ” is the keyword. The best anchor is always a stud in the wall. You can locate this stud by and electronic stud detector. 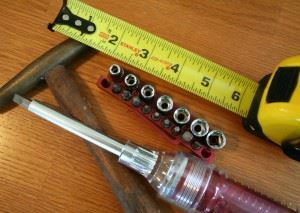 These are tools in every contractors toolbox. Just move them along the wall until you find the stud. That’s where you should hang your picture. If you want to put up something where there is no stud, then need to use an appropriate anchor. Your hardware store will know just what you need. Be sure to know how heavy the object is to get the proper anchor and hook. Cleaning gutters is not really challenging. All you need is a sturdy latter and a good pair of work gloves. It might help to have someone spotting the latter to keep it from wobbling. Cleaning gutters is a task that should happen at the beginning of fall and at the end of fall. If you see icicles forming, then it’s a good sign that your gutters need cleaning again. A toilet that is running can be a nuisance not only from the sound but also from the waste of water. To find out what’s wrong you need to flush the toilet and then open the lid to the tank and see what’s happening. Any part that needs replacing can easily be found at your hardware store and many of these parts are universal which makes swapping them out very simple. As mentioned, there are some tasks that you might want to bring in professionals. That certainly holds true for junk hauling. This is a job that is best turned over to Junk King Chicago. This company has been hauling away rubbish from homes, apartments and businesses for over 12 years. They’ll be able to cart away anything you want to get rid of regardless of size or weight. As a homeowner you can take care the little repairs and let Junk King Chicago take care of the junk hauling. This entry was posted in Chicago Junk Removal and tagged clutter, homeowner, junk, repair, task on August 31, 2017 by Junk King. Last updated August 31, 2017 .